These 6 parts are under constant wear while your chair is in use. Usually the parts should be replaced on any chair more than 2-3 years old or older. 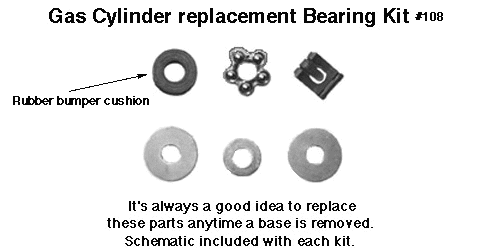 The rubber cushion gets mushy or breaks, bearings wear and internal washers get worn grooved. The clip is easily damaged upon removal and may fall off while in use permitting the piston rod to extend, hit the floor and high center, or bend, rendering the gas cylinder useless.